Lead has been used to great effect as a roofing material for many years now. Harly any old churches exist that don't have lead on their roofs. In fact most buildings that have been erected in the past 100 years will have some form of lead sheet installed. Lead is widely used in roofing because it's an abundant and very cost effective material that is water resistant and highly durable. Although lead is often used as a roofing material, prolonged period of exposure to the elements can affect the performance of lead. If your lead roofing is looking a little worse for wear, you may be wondering when lead roofing should be replaced. T.J. Copping will be able to advise you as to if and when any repairs or replacement of lead will be necessary. In general though, lead commonly lasts longer than the life span of the buildings it is fitted to, with little to no drop in performance after 200 or so years. However, the life span of lead roofing can be dramatically reduced because of poor installation and fitting. If lead roofing, cladding or flashings are in good condition, your roof will only require occasional maintenance. It is very rare for a building to require a whole new lead roof, even in cases where the roof looks to be in a complete state of disrepair, it frequently will only need spot maintenance. It has been estimated that about 70% of the lead sheet currently produced is used for flashings and weatherings to be used in the construction details on roofs that protect vulnerable joints in buildings, such as where roofs meet with walls or the roof pitch changes. Of the remainder, about 50% is used as the main roofing material on new housing developments and the remainder is used on various restoration projects. The advantages of lead sheet as a roofing product are in its durability and longevity. 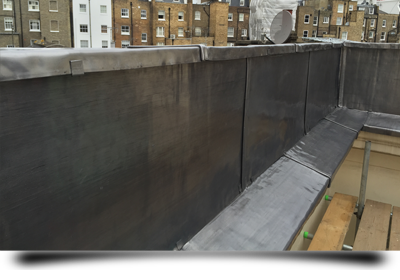 Another good thing about lead is that it is incredibly flexible, conforming to all manner of roof shappes, nooks and crannies, making it the perfect roofing material. Lead also can be painted with a metal paint, offering the homeowner to have a product that will either blend in or compliment the rest of the property. Lead can be used for various elements of a roof and can be repaired with various materials. Below are just some of the most common uses for lead or lead work that T. J. Copping Ltd Roofing Specialists carry out on a regular basis. Why do people have lead roofing? Although lead is basically metallic grey in colour and therefore less than attractive, it is a very sought after roofing material. To get around the plain look of lead, people often paint it with various specialist finishes to compliment their property. As stated above, lead is highly flexible and stands up to the elements very well and for many years. Not all roofing companies can carry out lead work, but T. J. Copping Ltd is trained and experienced in lead working skills and will not only enhance the aesthetic appeal of your home, but the lead will keep your home dry for many years to come. When repairing lead roofing, a roofer may use new lead sheet and very carefully weld it over any splits or cracks they find. This is a cost effective way to repair a damaged lead roof. We often find that the cause of a lead roofing failure will be caused by the ends of the lead which haven't been secured properly. In this is the case, a new roll of lead will need to be installed. The actual cost of repairing lead roofing rather depends on the amount of repairs needed. A small amount of lead roofing repairs will not cost you very much at all, however like anything in life, the larger the repairs needed, the more it will cost you. any inherent design faults in the roof. we always look for serious ripples or splits in the lead sheeting. Ultimately, the decision on whether to repair or renew the lead on your roof will be influenced by certain other factors. A parapet or central valley gutter lead lining may be in a reasonable state of repair and when considered in its own right, worth repairing to extend its life by several more years. But if adjacent slated or tiled areas are to be renewed anyway, then the cost of renewing the lead gutters at the same time would be well worth considering. So no matter what sort of roofing work you require at your London home or business, T. J. Copping Ltd Roofing Specialists really should be the first roofing company you call. With many years of experience in the roofing industry, we will be able to offer you an unrivalled, professional and great value for money service. Like what you've read? Want to know more? Then please do not hesitate to call us on our office number: 01438 229 655, our mobile number: 07961 147 476, or alternatively, please click here to make an online enquiry today.